Bamff has an abundance of walks and wildlife, as well as golf, fishing, cycling, horse riding, rambling all within easy reach. Bamff is home to the an extraordinary wetland restoration project using European beavers. The beavers have built around 20 dams on the estate and their habitat is fascinating to visit. 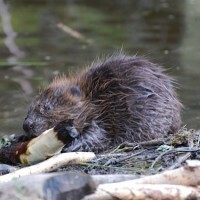 The beavers themselves may also be seen on summer evenings. Beaver wetland walks and beaver watching are both available free to occupants of Bamff Old Brewhouse. Bamff is also – uniquely in this part of the world – home to a family of wild boar. During your visit you may see them being fed. Bamff is beautiful at all times of year. Bamff offers many pleasant walks for those who enjoy a quiet activity. Woodland walks are pleasant and a gentle exertion will take those so inclined to viewpoints from which a fine panorama of the Eastern Highlands may be enjoyed.